There are no illusions in this 28 Days to Diva series. You simply cannot ‘business plan’ your way into a singing career. You absolutely need to have the love and the skill for classical singing. If any of those areas are lacking, the answers will not be found in these posts. Ask yourself, seriously, if you could be just as happy being successful at something else. However, if you have the deep understanding that this is what you are meant to do, I am here to help you figure out how to make it a viable choice in today’s reality. Singing for the love of singing is a completely worthwhile decision. If you do not want to mix money and music, you may want to consider how to fund your music-making in other ways. If you desire to sing professionally and make it your full-time job, you will need to be adequately prepared for the financial aspect of your business. You will need to be able to synthesize your business in terms of projections, cash flow, and investments. Financial planning probably was not the backbone of your educational experience. It isn’t too late. Today is the day to begin anew. We discussed the beauty of financial freedom yesterday. When you are in the feast or famine cycle of freelance work, that goal can seem out of reach. In order to start feeling more control in the financial arena of your life, you need to know how much cash is coming in, how much you are spending, and your anticipated earnings. As you start to sign contracts further in the future, you will want to see when that income will be usable in the future. Having a cash flow worksheet helps you avoid the terror of a budget-crushing bill landing in your mailbox. When you are in the middle of financial crisis mode it is practically impossible to see beyond the immediate. Setting up a cash flow worksheet like this one or this one will be an active system (Remember Day 1?) that prevents that horrible unstable situation. Do You Have These Seven Bank Accounts? When I originally read the headline, “The 7 bank accounts every family should have“, I think I choked on my coffee a bit. Seven bank accounts?! Who has seven bank accounts? Then, as I read through the post it made more and more sense. With all credit given to Jordan, the Fun Cheap or Free Queen, I have combined her concepts here for singers to follow. This is strictly a savings account that you should not touch. Jordan writes, “Picture it as the fireproof apocalyptic vault hiding behind concrete walls in your basement, or the piggy bank you have to shatter to open.” In fact, I chose an online bank with a really high APY so that I could just let the money accumulate there and it would be harder to touch. Ideally you want to put 20% of your monthly income in this account. Having 6-12 months of savings to live off of is extremely important in the freelance world. This is the money that you are actively saving for something in the foreseeable future or a short-term emergency. Try to automate the deposits into this account and your emergency savings as much as possible. If you have a day job that offers direct deposit, you can often set up multiple accounts and corresponding percentages for those regular paychecks. If you can’t set it up automatically, you will want to build in the systems to divvy-up the percentages manually. This will continue to be your financial center. This is where all the money pools before being allocated to other areas and accounts. Pay your bills from this account. Linking to a site like Mint will help you fill out your cashflow worksheets using their reports. Try to set up your bills to be paid automatically so you don’t miss a payment when you’re singing on the other side of the world and suddenly the WiFi in your hotel doesn’t work properly or isn’t secured. You may even catch a percentage break if you sign up to make payments automatically. Avoid fees in this account by making sure you knowing bank’s required minimum amount and not overdrafting your account because you are not paying attention to deadlines and cashflow. Sometimes couples like a lot or little to no autonomy in their spending. You need to decide what is right for you and your family. If you are not married or co-habitating, you may want to re-purpose one of these checking accounts to be your “singing business” checking account. It will be easier to keep track of your tax write-offs if you only use one fund to pay for them. This is the account that catches all the leftovers from any other area. This is similar to the coins you catch in the laundry room. It may grow slowly but it is there – just for fun. Do some prioritizing before letting money accumulate here. First, make sure that you are putting at least 20% away in your savings accounts no matter what. Then, pay down your debt. If you still have debt, you may not want to be putting money into the slush fund quite yet. If you don’t have debt, then let that change fall into this jar. Whew… that seems like a lot. Remember: your job is to sing. This is just how we try to avoid the pitfalls that get in the way of doing our job. Don’t wait for someone to come along and bankroll your career. Be your own sugar mama, diva! Let me know if you have any other financial tips and tricks to share with the diva crew. 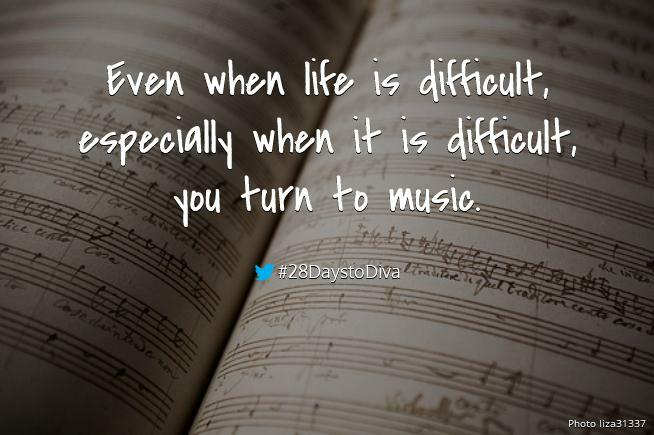 I would love to read them in the comments below or on Twitter (@mezzoihnen) using hashtag #28DaystoDiva.